Our mental health can vary in time, from very healthy all the way to requiring hospitalisation. Each step of the way there are things we can do to help or hinder our level of wellbeing. For example we can actively doing something positive like listening to music; we can avoid things we know are bad for us like drinking too muchl or we can call for help when we can’t do it alone anymore. There are also external factors that we cannot control, and while it is important to recognise that this is true, this document focuses on the choices we can or should make around our health and wellbeing and the actions we can take in response to them. “My Wellness Plan” is a formalised system for writing down the most common elements that we come across as our health declines, to remind us what we should do to help ourselves. This is particularly useful when it is hard to think or trust others. We just have to look at the plan we made and trust ourselves. This document is a dynamic document, that is, it changes over time. After an incident, it is very important to review the plan and change what doesn’t work and emphasise what does. 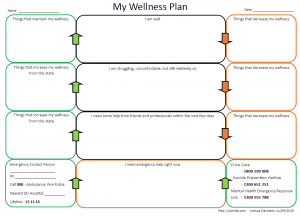 A full downloadable copy of “My Wellness Plan” can be found here: (My Wellnesss Plan (PDF 30 kb)). Providing a date on the document lets you know when you created this version and how old the document is. If it is too old, check through it and see if the details are still relevant. All things change in time, and it is important that in a crisis this document is as accurate and useful as possible. When these aspects stop or change it indicates that you may no longer be on this line of wellbeing and may need to consider that you have dropped to the next level. Each of the three layers has indicators to help you assess which level you are currently on. The box to the left of each layer has ideas to help you rise up while the box to the right has things to avoid or watch out for. There are three boxes with these titles, one on top of the other. Each layer indicates actions that help us get to the next layer up, or to maintain the top layer. The top box is all about manually maintaining good health. These are the new habits you are trying to instil in your daily regime. Over time, these manual habits become automatic habits and can be removed from the box. It is good to add new habits in. There are three boxes with this title, one on top of the other. This is to indicate the series of things that decrease our mental health each step of the way. As our health drops down a layer of wellbeing, the things we need to watch out for and avoid will change. For example, when you are well, you may not need to watch out you may need to watch out for negative self talk but not for suicidal ideation. On the other hand, when you are not doing very well, suicidal ideation may now be a big factor. This layer is recognising that you have gone beyond being able to help yourself, either on your own, or with a little help from non-time sensitive friends and professionals. This is time to call for the big help, go to hospital or get some other immediate help such as a crisis line. The central box lists ways to identify that you have reached this level of immediate help. It is important to make this a black and white identification process. Frequently when we reach this level of need our thinking can be clouded or confused. It may take a friend or relative to show you the box and say “you’ve written on there that when you do X you should get help – so let me get that help for you”. The boxes on either side lists ways to get that immediate help. This version is tailored for Australia, other countries will have other organisations and emergency numbers. If you need a copy of this document to tailor for your country, please email me at joshua.davidson@jomida.com. After you have used this document to improve your health, it is important to make time to review how effective the document was. This is the dynamic aspect of the document. What worked? Keep that. What didn’t work? Modify that. How would you do things better next time? Make the change, make a new date and try it again.